Mr. Marlin is hunting big game in Africa. The man is charged by a bull elephant, but he calmly shoots it dead in its tracks. One of his underlings congratulates the hunter for killing the last Madagascan Blue Elephant. Marlin orders his employee to make plans to have the body sent to a prepared trophy room. The hunter then boards a helicopter and complains that he’s tired of the “usual” big game – that he needs to hunt something more “exotic”. As he speaks, Marlin is reading a newspaper clipping reporting sightings of a huge alligator. The hunter tells his servant to make arrangements for him to fly to New York City. As the helicopter veers off into the distance, an armed man grasps the discarded article and shakes his fist and the craft, vowing that he won’t fail to catch Marlin again. Meanwhile, the Turtles are battling the Foot. The Clan members soon retreat and the Turtles head for home – on their journey, they are spied upon from the waters of the sewer by two very large eyes. Marlin has arrived in New York City. The hunter and two of his lackies make their way into the sewer. The man pursuing them is not far behind, and he vows that this will be Marlin’s last safari. Almost immediately, Marlin and his men stumble into the Turtles. The hunter is surprised, but he acts quickly, firing at the Turtles in hopes of making them trophies. The Turtles escape by swimming through the sewers, but when they emerge, they’re facing a large group of Foot Soldiers. As the battle rages on, Mikey finds a secret door in the sewer wall. The Turtles head for the escape route as Marlin begins firing his rifle into the melee. Inside the secret door, the Turtles find an apartment with a laboratory – and stranger yet, there are machine components lying around from the T.C.R.I. building. Don wonders if an Utrom is living here, but Raph is doubtful. Suddenly, Marlin breaks through the wall and points his gun at the TMNT. As he menaces our heroes, the hunter gloats about what fine trophies the Turtles will make. Suddenly a huge alligator-man attacks! Leatherhead grabs Marlin and the man faints! As the group heads for safety, Leatherhead explains that he was an ordinary gator that had been flushed into the sewers long ago, and that he had been found by the Utroms. The aliens took him to their lab, where he was accidentally exposed to Mutagen and took on his new form. The Utroms accepted responsibility for the error, and took Leatherhead in as one of their own. Since the T.C.R.I. building was destroyed (TMNT #7), Leatherhead has been working on his own to try to contact the aliens, in hopes that they’ll return and take him with them to their world, where he can live in peace. The group emerges into a huge cavern, a bridge spanning its gap. The hunter surprises them again, running up from behind, gun in hand. Leatherhead tells the Turtles to make a break for the bridge. Leatherhead uses his tail to break the bridge in half, separating the Turtles from the hunter by the length of the crevice. The plan works for the most part, but the gator is forced to cling to broken bridge on the other side of Marlin, which gives him a clean shot at all of the mutants as the Turtles struggle to save their new friend. Before Marlin can fire his gun, a thrown knife stabs into his trigger hand – and the man that has been chasing the hunter reveals himself. The fellow explains that he’ a representative of all the animals that Marlin has slain, and that he’s come to arrest him for his crimes. Marlin recoils at the thought of being caged like an animal and backs away from the lawman. The hunter gets too close to the edge and stumbles, falling into the pit below. The lawman stares in stunned silence at the mutants across the gap, and Leo announces that it’s time to go home. 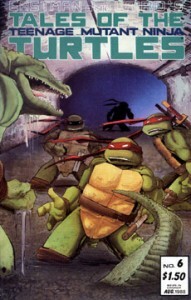 The Turtles lead Leatherhead to their old lair in the sewer, a place where the gator can continue his work in safety.